A team of astronauts are terrorised by an alien life form discovered on Mars in Daniel Espinosa’s sci-fi horror Life. Before I get started, there are a number of reports floating around the internet that this film could be a backdoor prequel to a solo film featuring Spider-Man villain Venom. To help manage your expectations of what this film is I can confirm that it definitely isn’t and that will become clear very quickly when watching it. Ever since Alien; sci-fi horrors are a dime a dozen and many films have been made where strange creatures hunt their victims in confined spaces. It’s an easy set-up as horror goes as it preys on the natural human instinct to be trapped in an enclosed space with no hope of escape. Put that in space and there are all sorts of other dangers to be concerned with. Life very much follows that formula and mostly does it well. The International Space Station is an enclosed setting that has enough room to move and plenty of places for the creature to hide, outer space has its own terrors and the characters are isolated from outside help pretty early on so all the ingredients are there for a solid horror experience. 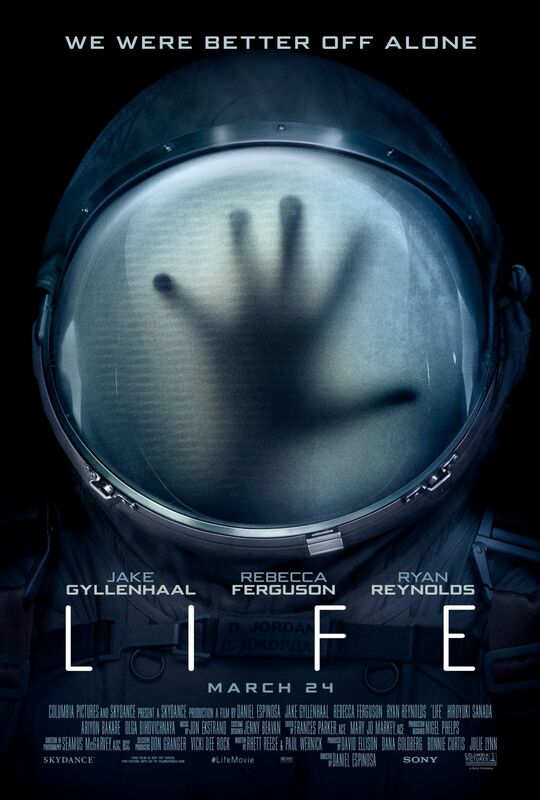 For me, this film was most interesting when it was concerned with scientific exploration. The creature is a fascinating discovery and I was fully on board with resident scientist Hugh Derry’s (Ariyon Bakare) attempts to study and understand it. Call me old fashioned but I enjoy when there’s an element of science in my science fiction. Some time is spent on the tests and theories surrounding the organism -dubbed Calvin for convenient refernece- and these scenes work well because it shows a group of astronauts excited about being the first to discover life not from this planet. Ariyon Bakare capably delivers the scientific curiosity and is always believable as someone who is the best in his field. The rest of the cast are no slouch either but they don’t always have a lot of decent material to work with. Ryan Reynolds’ Rory Adams is a Ryan Reynolds type wise cracking engineer, Jake Gyllenhaal’s David Jordan has a little bit of backstory as someone who prefers living in space, Rebecca Ferguson is responsible for the safety of the station and comes across as competent in the job she’s given while never succumbing to being a damsel in distress Hiroyuki Sanada’s Sho Murakami has a lot to lose with a newborn child back on Earth and Olga Dihovichnaya’s Ekaterina Golovkina is there for the space walk sequence. It’s certainly a diverse cast and the film deserves points for that but the characters are very shallow. There is enough to them to make their deaths matter but not by much. Despite the thin characterisation the characters bounce off each other well with a natural rapport making it believable that they have worked together for some time. Unfortunately the human characters bring the film down somewhat as they succumb to the usual horror tropes of making really stupid decisions so that they can be placed in mortal danger. It’s forgiveable to an extent given the high stakes situation but they are supposed to be highly trained professionals who can keep their heads in a crisis. They largely manage that but there are moments where unreasonable stupidity puts them in danger. The alien itself, Calvin is an excellent antagonist. It’s one of those truly alien creatures that can’t be understood or reasoned with. Everything about its behaviour is complete guess work from the characters which means that random actions are pretty much built into its design. Visually it’s great to look at with an uncomfortable slimy texture that just feels unpleasant. The way it goes about attacking its victims with tentacles that go down the throat along with the general efficient viciousness that it becomes known for is truly unsettling. Similar to Alien; the creature grows in size as the film progresses which makes for a natural transition from innocently harmless to terrifying and deadly. I’m not sure it’ll go down in history as one of cinema’s greatest monsters but it is certainly memorable. I found the International Space Station to be an effective setting as it was appropriately claustrophobic and menacing in its own right. An effective single take sequence at the start of the film teaches us the geography of the surroundings and then the film allows the setting to become appropriately foreboding as time goes on. There are lots of ways for Calvin to use the surroundings to put the crew in danger. The film will remind many of us of Gravity but that’s largely in a positive way. A solid sci-fi horror that allows for some scientific discovery as part of the narrative. The characters are all very thinly written but the performances go a long way in giving them personality and a sense of familiarity them working together for some time believable. The alien creature is visually interesting to look at and truly terrifying in the way it goes after its victims. It may not go down in history as one of the best horror movie monsters but it is memorable. I found the International Space Station to be an appropriately claustrophobic setting with lots of opportunities for the creature to use it to its advantage. One thing that lets the film down is that the characters sometimes make stupid decisions that put them in easily avoidable danger. These instances aren’t as frequent as they are in other films but they do happen and it’s something that could have been avoided without harming the film.